ANNOUNCEMENT: Today’s Release of THE JOY OF SEXUS, plus special Guest Post + GIVEAWAY!! Today I have the immense pleasure of bringing to you my lovely readers, the Enchanting Vicki Leon! Her fabulous book: THE JOY OF SEXUS, is being released today- AND- she’s giving away a copy of her book to 3 of my lucky Winners!! 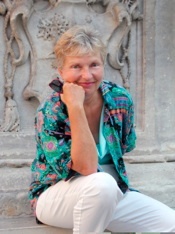 But first here is a great guestpost by this fantastic author- Please welcome, Vicki Leon! More than a bittersweet fling, this decades-long grand amour involved the most famous man of his era--and history’s FIRST cougar! Her name? Servilia Caepionis,whose graceful elegancedoes sound catlike. From an aristocratic Roman family, she had it all: passionate personality, looks, and brains. Even in her late forties, her allure bewitchedRome’s supreme military commander. He was barely 36, a brilliant big thinker, politician, and warrior, busy conqueringthe then-wild lands of Gaul and Britain when not busy seducing a long list of illustrious women. His name? Gaius Julius Caesar. Around 64 B.C., when love’s thunderbolt struck, they were both married to their second spouses. He had a daughter; she had a son by her first husband, and three girls by her second. Messy; but they were unrepentant--and their spouses went along. A risk-taker and political activist, Servilia relished action. At times, outrageous action. Although as a woman she could not hold office, her younger half-brother Cato was an important senator. During the ardent early days of her romance with Julius, on a whim Serviliasenta note to her lover. It so happened that Caesar washard at work in the Senate chamber, deep in a rancorous debate overahuge conspiracy case with Servilia’s brother. When her note got delivered by messenger, Senator Cato immediately thought it related to the conspirators. He didn’t ask, he demanded to have it read. Read aloud. The chamber went silent, the senators hanging on every red-hot word. Catono doubt turned crimson himself, as he learned--in front of his peers-- about his sister’s adulterous feelings for his prime political opponent. Afterwards, Servilia and Julius may have laughed about it together. Thatsemi-comic episode, however, would have dire consequences. From that moment on, Senator Cato and his conservative followers loathed Caesar. More than political foes, they became dangerous enemies, the nucleus of a “save Rome from Caesar’s monarchy”movement. Even more heartbreaking, their animosity would eventually involve Servilia’s own son Brutus, damaging his relationship with his mother, and motivating him to take an active role in future disaster. a later historian, after listing many of Caesar’s female conquests, says admiringly: “But beyond all others Caesar loved Servilia.” Clearly, in terms of attention paid and years spent as lovers together, it seems to be true. Julius once gave Servilia a glorious black pearl from Britain worth six million sesterces. More than that, he gave her twenty years of his devotion. Two decades after their tempestuousaffair began, Servilia lost the grand love of her life. On the Ides of March, 44 B.C., on the marble floor of the room where the Senate met, a disorganized group of conspirators stabbed Julius Caesar 23 times. Servilia never saw Julius in the flesh again. Instead she had to endure the grotesque display ofhis lifesized wax statue, accurately depicting his 23 knife wounds, in the Roman Forum. Servilia lost more than the man she adored. She also lost her beloved only son Brutus, a ringleader in the murder conspiracy. A final horror: Servilia’s son-in-law Cassius, married to one of her daughters, was also a co-conspirator. In the chaotic aftermath, a grieving Servilia tried but failed to save the lives of her guilty kinfolk. Nearly everyone in her social circle died in the years of civil war that ensued. She, however, may have seen her seventieth birthday,given shelter in the countryside home of a longtime friend. As a writer myself, I like to imagine Servilia, well-educated, still sharp as a tack, writing her tell-all memoirs in this safe harbor. What a saga that would be! Although a fictionalized version of Servilia as Caesar’s lover appeared in the HBO/BBC epic Rome, their largely unremembered liaison deserves a film or book of its own. What do you think? I love Vicki Leon’s books! These are filled with utmost originality in content, presentation, details, facts and entertainment- and that’s in Nonfiction- History books!! It’s true. If you’ve ever read any of her books you know exactly what I mean. So, when I was offered THE JOY OF SEXUS for review- I lunged for it! I know, I know, some of you may be reluctant because of the title…Let me begin by saying, it’s HISTORY! This wonderful little book contains all the beliefs, superstitions, spirituality, love and more that originated back then. Ever wonder how all of the above ever came about? Where did the terminology come from? What is the root of those beliefs and practices? Well, THE JOY OF SEXUS, will clear that up and give you sometimes more information than you need…but in such good taste and humour that you will be chuckling the whole way through it. And historically speaking, this book will put you at the forefront of ‘the reasons why’- conversation starters and movers that can be used at cocktail parties or nerdy history conferences alike! I particularly loved the stories on the ‘celebrities’ of back then. Who knew that Caesar loved a certain Cougar to death? (…me who thought no one could top Cleo!) My all-time favourite couple was Pericles and Aspasia- such romance! Vicki Leon engages her readers by peaking our interest from the very first page to the last. This is the kind of history that will be retained because of the immediate interest it evokes and the in-depth info it provides. All those juicy details that beg to be told don’t just pop in here and there- the book is filled with them! I can honestly say that I learned something new and interesting on every page. A five-star read!!! I highly recommend this book! 3- For Additional Chances, post on FB, Twitter, Linkedin, Blog and elsewhere! Just come back and post your link in comments. So how could you top MASTER OF VERONA, in terms of historical splendor, mystery, fast-moving pace and typically, a masterpiece? Well honestly, David Blixt did it again! I absolutely loved MASTER OF VERONA (my review here )- and as soon as I finished reading it, I immediately began VOICE OF THE FALCONER. In this equally satisfying novel, Verona is at its prime. The story takes place a few years after Master of Verona, and it follows the life of Cesco, Cangrande’s illegitimate son, with Pietro as his guardian. The mystery, intrigue and suspense are de rigueur throughout, but it’s once it appears that Cangrande is dead that it gets particularly good. Pietro must get Cesco to be pronounced rightful heir…obstacles, obstacles and more…There is danger everywhere- and to boot- not everyone knows of Cesco’s existence! Great plot, lots of excitement, rich historical detail and a setting that is to die for (pun intended). A great story told by a brilliant author. 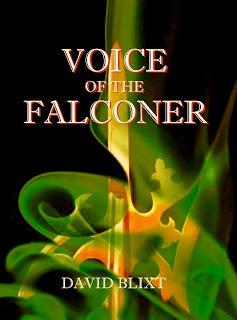 VOICE OF THE FALCONER throws you into a capitulating series of events that keeps the suspense and momentum going, throughout. It's just one of those thriller type mysteries that just keeps on getting better page after page- and additionally it's rich in history and impeccably written. Most entertaining! Read this- you absolutely MUST! Author Interview- Review and GIVEAWAY: GEORGETTE HEYER!!! Calling on all GEORGETTE HEYER Fans- Today you are in for a TREAT! 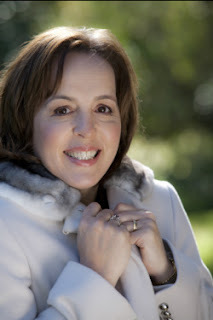 THE Georgette Heyer- All-time- Expert: Author, Jennifer Kloester!! What prompted you to begin researching Georgette Heyer? I was living in the Middle East with my husband and children. Life was really busy and Georgette Heyer was my favourite comfort reading. A friend and I used to discuss her novels and we often wished we had some sort of Regency companion that would explain some of the fascinating-sounding things in her books. We wanted to know what a barouche looked like and a Spencer and a half-robe and what was ratafia and how did one 'box the watch'? Things like that intrigued me so much that after we left Bahrain I started researching Georgette's historical novels. I became so impressed with her historical accuracy, her wonderful Regency language and her meticulous attention to detail that I wanted to know more about the woman behind the books. It turned out that she was intensely private and that there was far more to know about her life and writing than I'd ever imagined and that's what started me on the research path. In your research, was there anything you found about Georgette that surprised you most? Many things, but what struck me most was how she used her novels as an outlet for her emotions. Georgette believed in self-control when faced with a crisis or a personal tragedy. She was very British in that way and approved of the 'stiff upper-lip' response to hardship. She rarely talked about the deeper emotions but naturally she still felt them and her writing was her way of letting them out. After her father died so suddenly she closed off that part of her life and rarely ever spoke of it again but she carried the grief of her loss with her to the end of her life. I remember reading Bath Tangle and being struck by the scene where the heroine, Lady Serena, has met her former lover, Major Kirkby, and he openly expresses his sympathy at the death of her father; Heyer writes: 'As always, she was rendered uncomfortable by spoken sympathy. "Thank you. The shock was severe, and the sense of loss must remain with me for long and long, but you must not think me borne down by it, or out of spirits. I go on very well."' It is as though Heyer is speaking for herself and this is only one of many instances where I see and hear her in her novels. What was the most exciting part of doing the research? Discovering the untapped archives of Georgette's letters. I remember receiving permission from her son, Sir Richard Rougier, to get copies of the amazing archive of Heyer letters at the University of Tulsa. They sent photocopies of all 321 letters to me and there were over 600 pages. I'll never forget opening the box and taking out the first letter – written when she was eighteen about writing a sequel to The Black Moth. I actually criedbecause it was such an exciting and emotional moment. There were lots more exciting moments during the research but some of the most thrilling were when I was in the British Library searching for Heyer's early short stories. I trawled literally thousands of magazines, but the feeling when I'd turn a page and seeGeorgette Heyer's name underneath a new short story title – that was truly amazing! What advice do you have for aspiring authors on how to get started on biography writing – any important tips? Cast your research net as wide as you can for information about your subject. Follow up every possible research line, Read where your subject read and, if possible, visit every house in which they lived and any other place that was important to them. One vital tip (which may seem really obvious but which took me time to learn), above all, focus on the subject of your book and make them central to everything you write. I found out lots of great new information about people and things that I'm sure some readers would have found fascinating but unless it enhanced the readers' understanding and insight into Georgette Heyer, I cut it. This book is a must read for die-hard Heyer fans. Incredibly detailed, the book tells of Georgette’s life through a meticulously researched and fascinating read. Apart from the chronology of Heyer’s book writing and process, there is the biographical aspect that brings you right into her life. Who was this clever author whose ongoing captivating writing has us all hooked? What was she like? 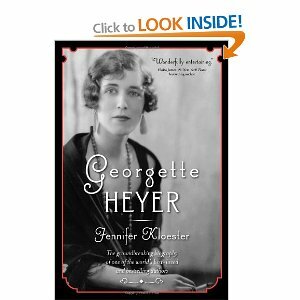 In GEORGETTE HEYER, author Jennifer Kloester reveals a woman who, contrarily to her very reserved exterior persona, spoke through her characters; allowing them to feel and express as she may never have been able to do so herself. The book is filled with interesting aspects that bring you closer to understanding Georgette Heyer. For instance, I was surprised to read that she didn't accept any opinions on her books, except those from her husband. He was the only one whose opinion she trusted. She also allowed him to help her with the plots. As a writer of historical fiction, Georgette was brilliant and after reading this excellent book I am of the opinion that her sparks of genius were also mirrored by bouts of eccentric thoughts. For instance, when Georgette was ill, and at some point it happened rather frequently- she would immediately think that death was imminent. Indirectly, through Georgette Heyer’s letters, much of what she felt was revealed and these also formed the basis by which we discover the depth of her person. I learnt so much about her life and her work! This gem is sure to satisfy all curiosity on the famous author- it does not disappoint. 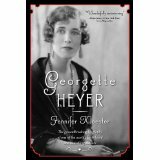 I highly recommend GEORGETTE HEYER, by Jennifer Kloester- it’s extremely well researched and offers a wealth of info that’s fascinating to read. 2- For Additional Chances, post on FB, Twitter, Linkedin, Blog and elsewhere! Just come back and post your link in comments.